By Oliver Van DeMille. An abs olute must-read book! This discussion of leadership education accurately exposes the conveyor-belt training systems we currently see in institutional education, instills the vision of what true learning should be, and gives clear guidelines on how to recreate the educational experience of Jefferson and his contemporaries in our own home or classroom, through a combination of mentors and classics. Although philosophically rich and very inspiring, this book also provides practical answers and substantive how-to-really-do-it details that allow the reader’s zeal to flow right into application. Above all, it is a book that will permanently change your concept of what education can and should be. Required reading for every serious parent, teacher, or private school administrator. By Oliver and Rachel DeMille and Diann Jeppson. The core unit of society is the family, and it is in our homes that our values and virtues most deeply take root and flourish. Regardless of where your children sit to learn, your home ca be transformed into a Leadership Education Home, a Thomas Jefferson Education environment. This volume offers something new, something which we all need: a view of Leadership Education from many angles, from the education of toddlers to advanced adult learning. Whether you’re a parent, teacher, administrator, legislator, professor or grandparent, this book is a must. Individually, the items in each package would total over $50.00, but we are offering them as a set for $39.00. Additionally we are including Andrew Pudewa’s talk “Rebuilding Your Education Paradigm” on audio CD as a bonus for purchasing either package (one bonus disc per family). Package A is recommended first. 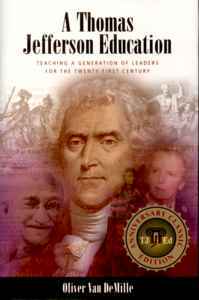 DeMille’s explanation of “The Seven Keys” will profoundly illuminate your understanding of the Thomas Jefferson Education approach, while the accompanying articles will empower you to make real, substantial changes in the way you structure education in your home or classroom. Package B will continue to develop your understanding and skill in creating a Thomas Jefferson Education style educational environment. With two CD sets and two new booklets of essays, you will be energized to keep striving, and “The Four Lost Ideals” lecture is superb for helping students themselves understand what this paradigm change is all about.